Let me start off by saying I wasn’t asked to do the comparison on these. I did this for myself and in hope to let others know what I came up with. Both knives can and will perform as you want them too. Remember these are razor sharp and will cut you really good. I know they will!! So let’s get started. 1) I had this knife first and the reason I got it was cause of the weight of it. It would save weight in my pack and I didn’t have to bring extra knives or sharpeners. 2) The blades are sharp!!! I gutted, skinned and deboned a complete buck with one blade, even caped the skull. 3) To me, the blades seem flimsy and wanted to break during the deboning and caping the skull. 4) Small handle. The back of the knife handle is open for easy cleaning. 5) Be careful of changing the blades, use some kind of pliers. 6) Mine didn’t come with a sheath, so I had to come up with something to hold the blades. 7) At Cabela’s the knife and 12 blades retails for $41.99. Replacement blades retail for $10.49 for 12. 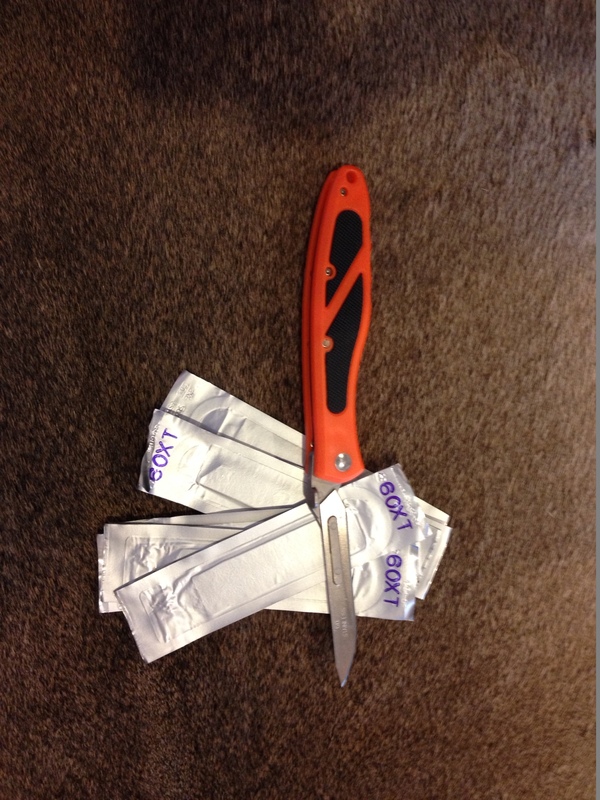 1) Little heavier in weight but still saves weight without packing more knives and sharpener. 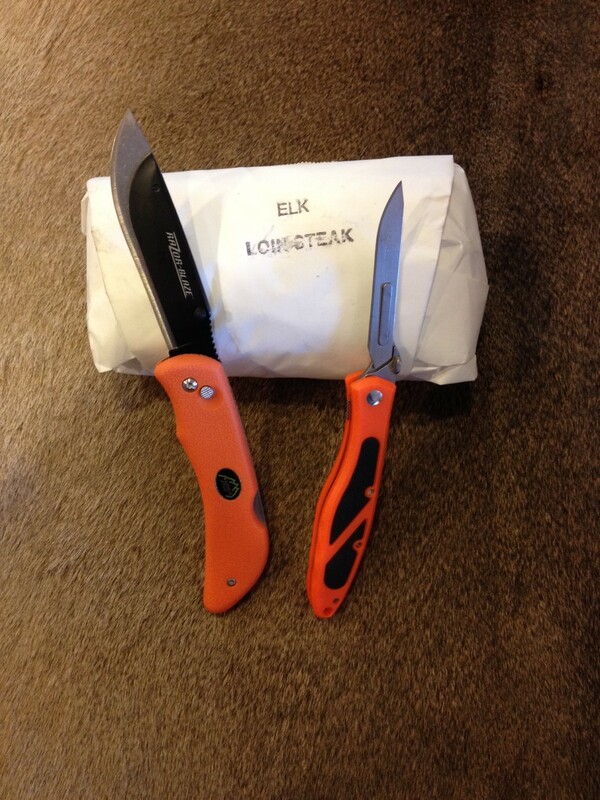 2) The blades didn’t seem to keep an edge while I cleaned an elk. I also lost a blade in the cavity of the elk. I think the release button for the blades is in the wrong spot and while working on the elk I must have pushed it. 3) Blades are stout and even use it to cut the lower leg off through the joint. 4) Handle was more comfortable. 5) As stated above the easy of changing the blade. Still be careful. 6) Has a nice sheath to hold knife and blades. 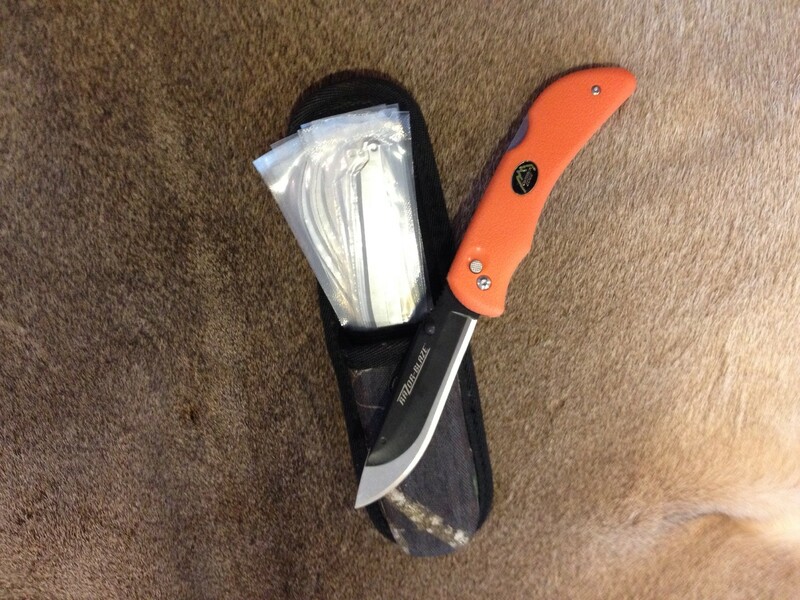 7) At Cabela’s the Knife, sheath and 6 blades retails at $39.99. Replacement blades retail for $12.99 for 5. Both of mine are colored in orange, so this color blind guy can see them when left on the ground. Outdoor Edge has a black one and Havalon has a couple of other options. If you ask me which one I like better, I will tell you try them both. I will be putting the Havalon in the pack. Yes, I don’t like how flimsy the blade seems but I know they won’t accidentally come off the knife. I can live not having a sheath to hold everything nice in one compartment…although I have friends that might tell you otherwise. 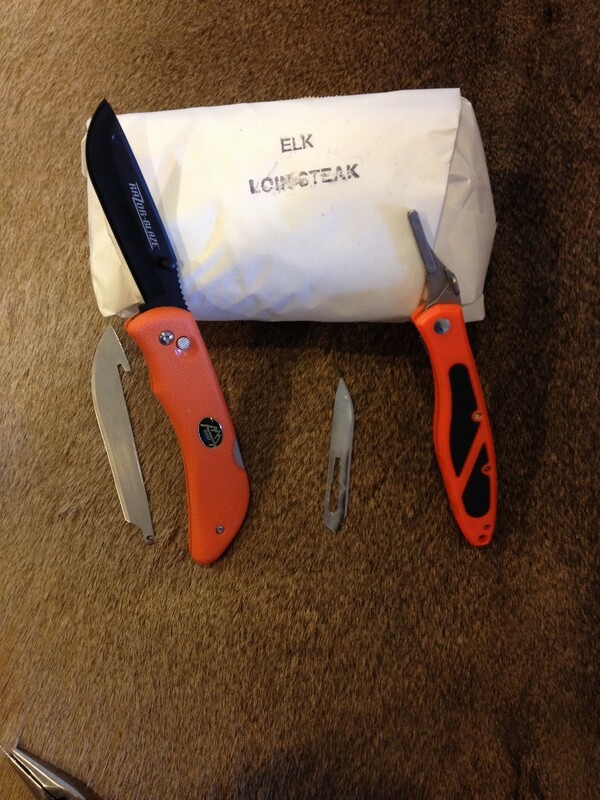 I did like the Outdoor edge knife and will go in my bag for ducks and turkey vest. Anymore questions feel free to ask. These are both great knives and I surely don’t want to say one is better than the other. They work and it is again your preference. Be responsible, ethical and teach them right. 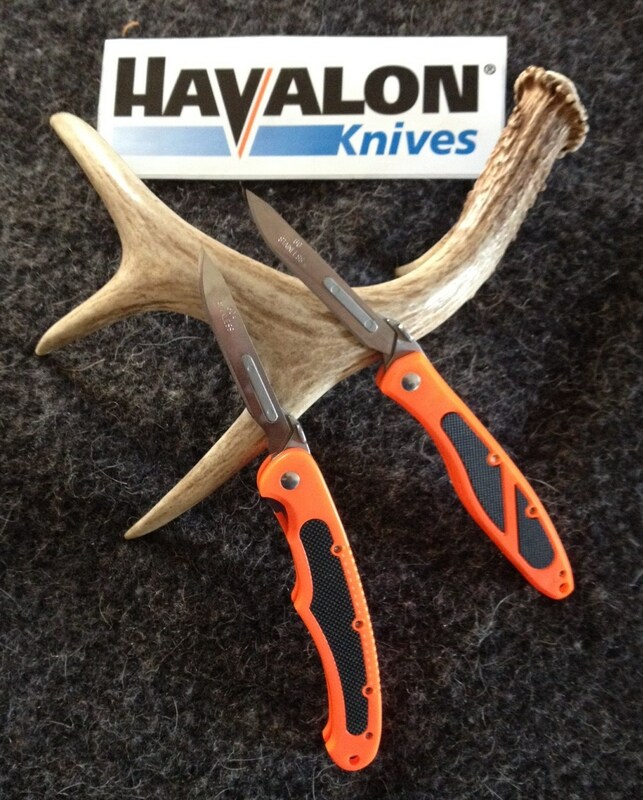 Update as of 3/30/2014: Thanks to Halavon Knives. They sent me a holster for the Piranta knife. It has a place for the extra blades and knife. I found that it is easier to remove the clip on the knife so it fix in the holster better. I went to Sporting good store to look at the knifes and the knives now come with a holster. The blades that come with the Edge are the #60XT the thickness measured with my calipers came out to be .020 thick. I found that the #60A will fit the Edge and measure .024 thick. A very big thanks to Havalon Knives the sent me a new Piranta Bolt, the handle is longer the the Edge and fits a little better in my hand. I can’t wait to use this knife for our adventures this year. Any Questions feel free to ask them here, If I can’t, I will contact Havalon personally to get them answered.